My Annual Paperdollywood Christmas Card for you! Bell, Book and Candle may not immediately spring to mind when you think “Christmas movie,” but think again. The 1958 non-sinister romantic comedy stars Kim Novak as a very chic witch who casts a love spell on conservative gentleman, James Stewart. The film features kookie supporting players; Elsa Lancaster, Hermione Gingold, Jack Lemmon, Janice Rule, Ernie Kovacs and a brilliant performance by a Siamese cat named Pyewacket. The story begins on a snowy Christmas Eve in Kim’s primitive arts shop and moves to a beatnik nightclub. All through the film I was focused on the highly dramatic wardrobe, costumes by famed Hollywood designer, Jean-Louis. My thanks for suggesting this film as inspiration goes to my daughter, fashion expert Professor Amanda Hallay-Heath. 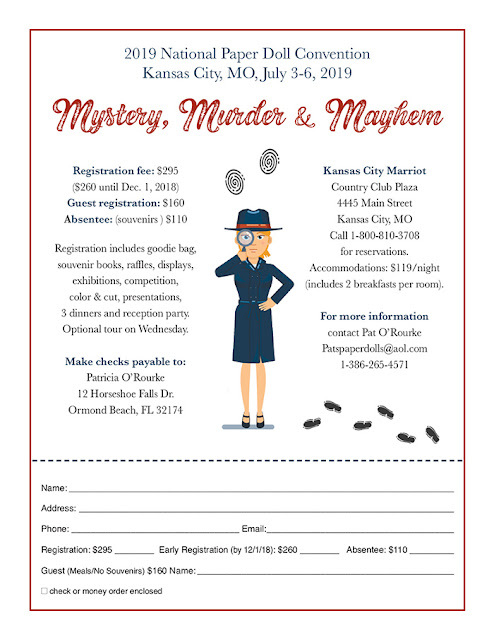 Click here for a printable PDF. 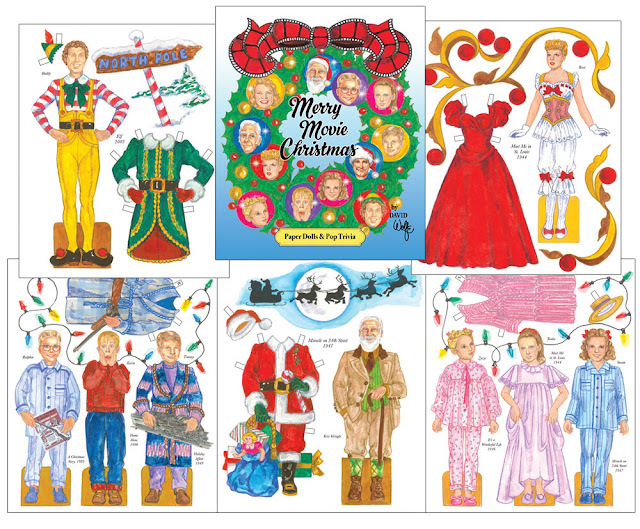 And visit paperdollywood.com to see my previous paper doll Christmas cards (located under the David Wolfe tab). 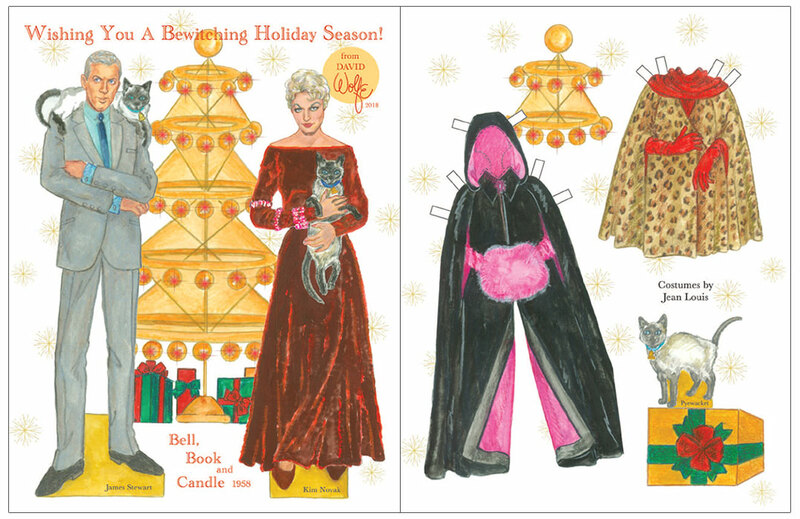 Bell, Book and Candle, 2018 Paper Doll Christmas Card by David Wolfe. 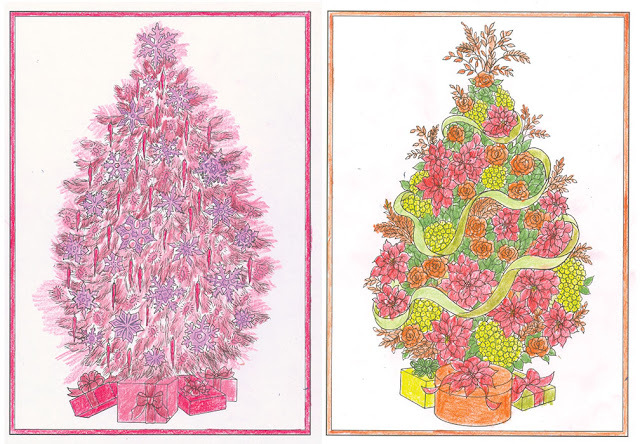 It’s easy to get into the holiday spirit when coloring the 30 fanciful trees in this imaginative book. 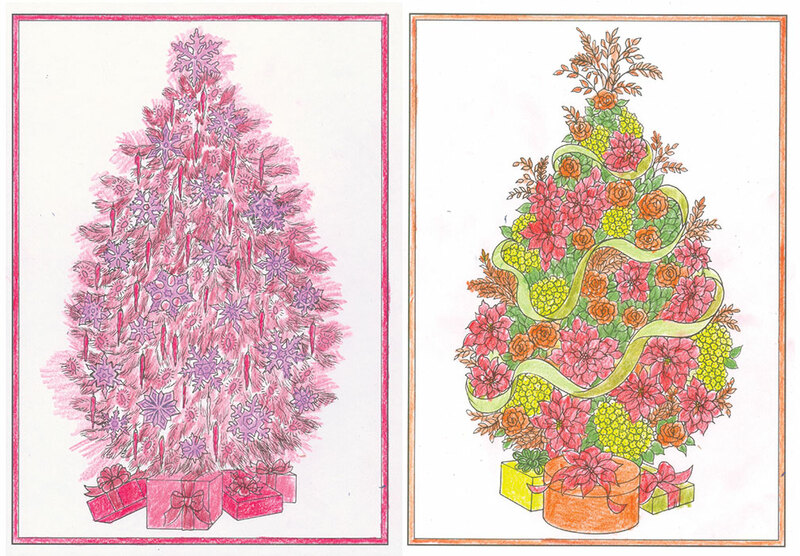 Christmas Trees Coloring Book by Barbara Lanza, $5.99 from Paperdoll Review. Some of the trees are fairly traditional, but it’s more fun to think out of the box and create surprising, original colorations. I’ve always favored live evergreen pine trees but now that I live in Palm Springs, California, I may have to update my thinking and go with a Post-Modernism tree in a surprising hue. Pink, orange, seafoam, white, silver and black trees are featured in two of the town’s terrific shops: Just Fabulous and Peepa’s. 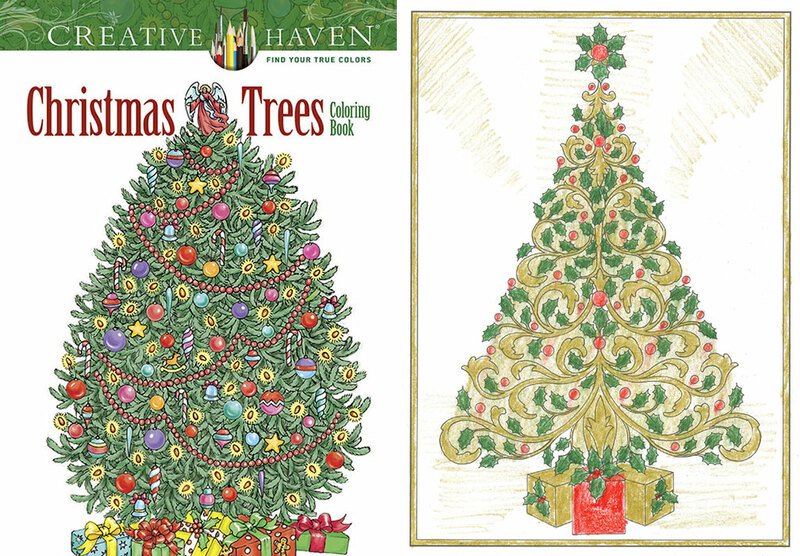 Coloring book cover and stylized ornamental tree. Multi-colored tree and a pretty pink tree. Just in time for gifting (or for hinting to receive as a gift). My new book, Merry Movie Christmas celebrates nine classic Christmas movies with twelve paper dolls and figures to cut-out and display during the Holiday season. This heartwarming book is the perfect gift for any family that loves Christmas and watches ever-popular vintage movies including merry musicals, sentimental stories and hilarious holiday comedies. Clarence the angel from It’s a Wonderful Life leads a parade of memories. Songstresses Judy Garland and Rosemary Clooney wear gorgeous gowns of poinsettia red as seen in Meet Me in St. Louis and White Christmas. The book’s center spread contains six child stars from screen favorites including Home Alone, A Christmas Story, Holiday Affair, It’s a Wonderful Life, Meet Me in St. Louis and Miracle on 34th Street. The young stars include Margaret O’Brien, Natalie Wood, Karolyn Grimes and Macaulay Culkin. Comics Chevy Chase and Will Ferrell make make ‘em laugh in National Lampoon’s Christmas Vacation and Elf. The book ends with Kris Kringle who believes he’s really Santa Claus in Miracle on 34th Street. This Pop Culture paper doll book includes a Trivia Quiz and a synopsis of the nine feature Christmas classic movies. Sample pages from Merry Movie Christmas Paper Dolls & Pop Trivia. My second paper doll book to be released this month celebrates a beautiful blonde movie starlet that you’ve never heard of… Lana Brittain. 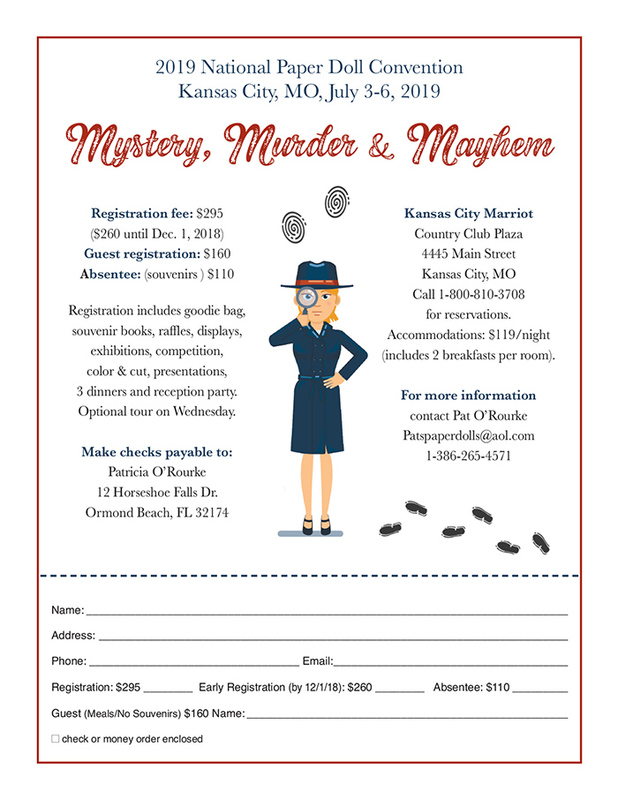 She’s a totally fictitious rising star who was discovered in the mid-1940s and signed to a major movie studio where pretty young ladies were groomed into goddesses. The Retro Movie Starlet book is an homage to the Golden Age of Hollywood celebrity paper dolls. I’ve endeavored to capture the Technicolor glamour of cinematic costumes by top studio designers. Lana Brittain is typical of the Hollywood star-making machine and her 8 pages of costumes could outfit her for the colorful musicals, the sentimental “woman’s pictures” and the patriotic dramas. Lana’s wardrobe includes many wigs and hair-dos. Many of the outfits were designed for publicity photos in magazines like Photoplay and appearances selling War Bonds. Starlets like Lana Brittain work hard to maintain their high gloss glamour. An additional reminder of the publicity star preparation is the importance of the Press Corps and this paper doll book features an exclusive interview of Lana by Hollywood’s most famous reporter, Louella Parsnips. I hope you enjoy this look back to the glorious, golden girls whose dreams of movie stardom came true. Unfortunately, Lana Brittain never made it to the top. In fact, she never made a movie but she fell in love with a studio cameraman, married him, had six beautiful blonde children and lived happily ever after…a typical Hollywood ending. 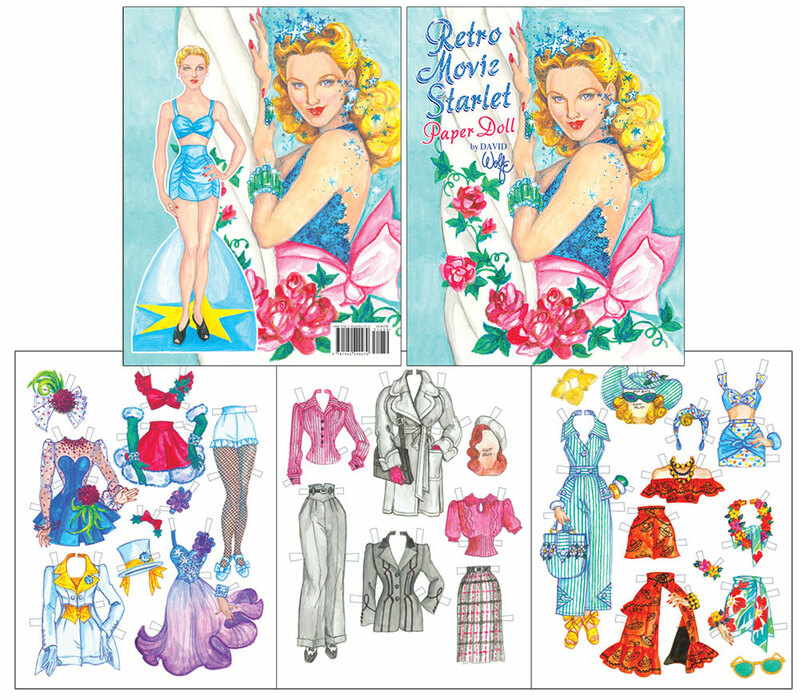 Sample pages from Retro Movie Starlet Paper Doll book. Thank you for your kind words. I'm so happy that you are so happy with my paper dolls...creating them is truly a labor of love. Merry Christmas and Happy Cutting! Thank you for sharing the beautiful Christmas card, it's fantastic! I love that movie and Kim Novak is one of my idols. You rendered her so well! The first time I saw her curled up on the couch in "Bell, Book and Candle", wearing her beatnik black turtleneck and slim pants, I vowed to aspire to that level of chic, cool demeanor and casual beauty. Not that it worked out but it's good to have goals. Thanks so much for the Christmas paper doll---a great movie! Wishing you a very Merry Christmas.